The e-Alpiswitch digital switchover board improves medical gas therapy accuracy and automatically ensures continuous supply. With digital gas source monitoring, medical staff knows precisely the level of gas that is in operation and in reserve. “Ceodeux Meditec developed e-Alpiswitch,” commented Ceodeux Meditec Marketing Manager Solène Garnavault, “in response to the market need for more accurate information that can be used to improve productivity and deliver better patient care." Ceodeux Meditec (http://www.ceodeuxmeditec.com), a business unit of Rotarex SA, announced today the release of e-Alpiswitch, the industry’s medical gas supply switchover board with an integrated digital display. To ensure a continuous supply of the medical gas that is essential for safe patient care, hospitals and clinics install redundant supply systems. One medical gas source is in service while the second is held in reserve. The introduction of e-Alpiswitch is the most accurate way to track the level of available gas in operation or reserve, and to avoid any risks of a breakdown of the system that serves the entire hospital. It delivers complete gas source monitoring that shows cylinder pressure, line pressure, source status (in reserve or in operation) and a low gas level alert. It is also equipped with a prevention and failure alarm system. Switchover from the operational gas source to the reserve is done automatically or semi-automatically. 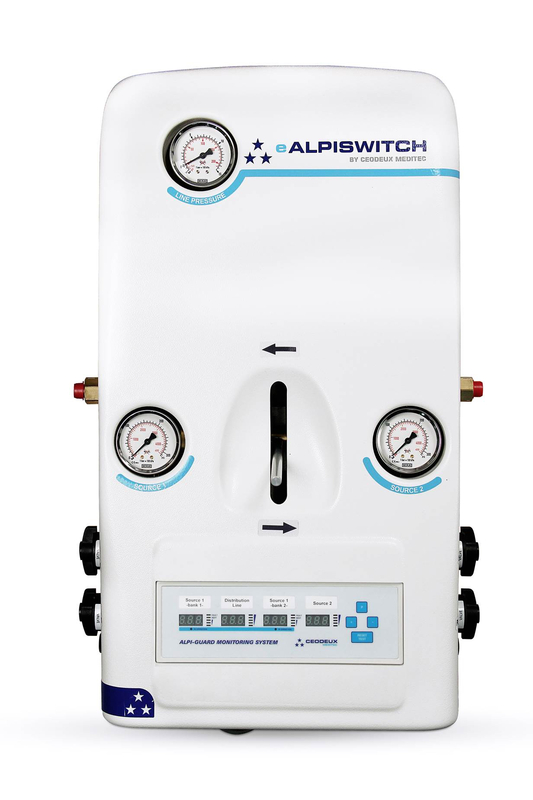 Featuring an all-in-one compact design, e-Alpiswitch is suitable for oxygen and all medical gases. Empty cylinder replacement and manual reset is easily accomplished without interrupting gas flow, ensuring safety. Visit the company website for detailed product information http://www.ceodeuxmeditec.com. Ceodeux Meditec provides medical gas safety, control and productivity for confident patient outcomes. It offers one of the industry’s most complete ranges of medical gas control equipment and is the world’s reference for medical cylinder valves. Experience, dedication to quality and technical excellence enable gas companies and hospital gas system installers to be confident that their projects will achieve the highest level of safety and performance. Present in over 65 countries with factories and sales offices in key locations around the world, Ceodeux Meditec customers receive the products and services they need wherever they are. ©2016 Rotarex. All rights reserved. Rotarex and its respective logos are trademarks or registered trademarks of Rotarex, SA. All other brand, service or product names are trademarks or registered trademarks of their respective companies or owners. e-Alpiswitch Digital Switchover BoardIntegrated digital switchover board improves medical gas therapy accuracy and safety.